Heavenly blog! : Nr. 336: Prophets service is intact today! Prophets service is intact today! Ephesians 4 11 And it is he who gave us some apostles, some prophets, some evangelists, some pastors and teachers. 1. Kor. 12. 28 And God set some in the church first apostles, secondly prophets, thirdly teachers, then miracles, then gifts of healing, of helping to control, various kinds of tongues. God has placed in his church including prophets. Can not you see it's not necessarily something wrong with the prophets, but he who does not see it. God himself says that he has set and the five different service offerings, he has sat in the church's prophet named as one of the five. From Wikipedia about the Prophet: A prophet is a person or messenger deemed able to communicate and manifest a religious message from a higher power or God. Prophets are known from Asian religion and are recorded in countries such as the Old Testament. From 1000's BC are groups of prophets who convey oracle in the ecstatic state known from Israel. Later, ca. 700 century BC know one of the prophets who were reform campaigns, for example, against the Canaanite broadcasts in Israel's religion. Among these we find Elijah and Hosea. Several of the writings of the Old Testament, attributed to prophets. (End of quote). Prophets in the original Hebrew, as it says Navi. Prophet or the Navi can be translated seer, mouthpiece or spokesman. I want to list 20 different aspects of God's word that explains and illuminates the prophets service is intact today, even after Lamb's 12 apostles died. Not least for preachers and those who have a responsibility in the church of God. 1) In the Old Testament was a prophet, a seer. 1 Sam 9:9 sometime in Israel, when they went to inquire of God: Come, let us go to the seer! For he that is now called a prophet, seer called sometime. A viewer sees something more than others. We know how it was with those who were watching. They saw something before the others and warned. So it is with the viewer and the Prophet. 2) In the Old Testament patriarchs were all prophets, and many other. Acts 7:37 He is the Moses who said to Israel: A prophet like unto me, God will raise up unto you of your brethren. Moses, Abraham and many more are in the Old Testament referred to as prophets. Prophet of service in both the Old and New Testament says that there is no "impossible" to hold service. We must not make the prophet of service exclusive and unattainable. 3) In the NT was more than the 12 Apostles mentioned as Apostles, ergo it is both the apostles and prophets today in the church of God. Acts 9:10 p.m. 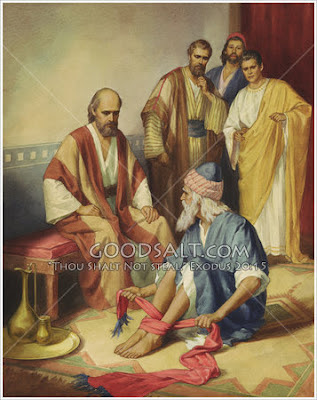 While we now were there for several days, a prophet named Agabus down from Judea; This was Agabus is hardly mentioned in the Acts However, both he and several others called the Apostles. And we find in Acts 13 other referred to as prophets. Acts 13. 1. In Antioch, the church there, there were prophets and teachers: Barnabas, Simeon who was called Niger, and Lucius of Cyrene, and Mana, foster brother of Herod the tetrarch, and Saul. 4) God placed in the church prophets. 1 Cor. 12. 28 And God set some in the church first apostles, secondly prophets, thirdly teachers, then miracles, then gifts of healing, of helping to control, various kinds of tongues. Notice the wording, God set. In the basic text are for continued, did set. This is a verb and means that God values ​​all the time. To install different offices in the church, is an ever ongoing process. 5) Prophets service belong to the church to be restored and grow up to the head which is Christ. Eph. 4. 12 so that the saints could be perfected to the ministry of Christ's body edification, 13 until we all reach unity in the faith and knowledge of him, the perfect man, to age the goal of Christ's body, 14 that we should no longer be minor, and let's throw and run after by every wind of doctrine by men, whereby they lie in wait to deceive, 15 but that we, speaking the truth in love, in all things grow up into him who is the head, Christ, 16 of whom whole body sammenføies and tied together at each band, which he gives, and is expanding its growth as a body to his edification in love, after all the activities that are allotted to each section in particular. Notice the wording, that God put these different offices so that God's people would "be perfected to the ministry of unity in the faith and knowledge of him, the perfect man, to age the goal of Christ's body, no longer be minors and let's throw and run after by every wind of doctrine of human games, in all things grow up into him who is the head, Christ, growing his growth as a body to his edification in love, after all the activities that are allotted to each section in particular. " All this was created preaching, foster and produce, Hallelujah, Amen! 6) How to distinguish the genuine from the false prophets. Jeremiah 15 16 I found your words, and I ate them, and your words were pleasing to me and to the delight of my heart, for I am called by thy name, O Lord of hosts! The fight against fake banknotes and falskmynteri has a long tradition in history. Just as long as people have traded coins, silver or gold or otherwise. there have been some who have tried to make fake coins. Just as long as it has been producing paper money, it has also been clever people who have made excellent imitations. The purpose is obvious: Fake notes and falskmynteri was an easy way to skaf ¬ fe their goods and services. One got the gain and wealth, but in a way that does not bear the light of day. Stories are told of the ancient Romans that they trained experts to reveal falskmynteriet in a rather special way. We should probably have thought that the most impor ¬ tant to such an education would be to provide an introduction to all known forms and types of counterfeit coins. This is obviously something they learned about. But the most important thing was to learn the real authority ¬ ten to know. They were to lift it, feel it, bite it and touch it. Do all they could to learn the real coin as closely as possible to know. If they got a fake coin in hand, they would immediately notice that there was a coin that stood out. One that was different than the real coins. Knowledge, knowledge of and familiarity with the real authority ¬ ten was the most important of all. Those who knew the real coin best, was the best to disclose falskmyn ¬ tneriet. It is by experience that Jeremiah did, that he found the word of God and became one with it. That meant he could also expose the false prophets. The more we have learned the truth, the easier and better, we reveal the lies, humbug and deceit. Just as for those who would reveal the counterfeit coins by learning the true knowing. This is also in the spiritual area. The more we learn the word of God and the power of Jesus' resurrection to know. For easier and easier it will be too revealing and know the difference between the true and the false prophets. 7) A prophet does not always say what the Lord says, etc. Room 12 6 And when we have different gifts, all by the grace given to us, let us, if we have the gift of prophecy, use it after we have believed. To prophesy, and do not necessarily say, 'Thus says the Lord. It is also possible to leave, but there is still a Thus saith the Lord behind. 8) The prophet need extra prayers as he stands in a field of tension. 1 Kings. b 19 Ahab told Jezebel all that Elijah had done, and all those he had killed with the sword - all the prophets. 2 Then Jezebel sent a message to Elias, saying: The gods do so to me severely, now and since I do not at this time tomorrow doing with your life as it is done with their lives. 3 When he heard this, he arose and went away to save his life, and he came to Beersheba, which belongs to Judah, where he made his servant to be back, 4 and although he went a day's journey into the wilderness; where he sat under a gyvelbusk, and he wanted his death and said, It is enough, take my life now, Lord! For I am not better than my fathers. 5 Then he lay down and slept under a gyvelbusk, then an angel touched him, saying unto him, Arise and eat; 6 And when he looked, he saw it at his head was a cake baked on hot stones, and that there was a jar of water, and he ate and drank and lay down again. 7 But the angel of the Lord came again the second time and touched him, saying, Arise and eat; Otherwise, the way you too long. 8 Then he stood up and ate and drank, and strengthened by this food he went forty days and forty nights until he came to the mountain of God, Horeb. The Prophet had won the victory over the false prophets on Mount Carmel mountain. Shortly after, he would die. It turns the prophet of old days. So it is today. Therefore, those who have a prophet all the backup service, goodwill and prayers he can get. 9) The prophet will not misuse his gift, but to bring revelation to the individual and the church. 1 Cor. 14. 3 on the other hand, who prophesies speaks to men to edification, and exhortation, and comfort. If a received a revelation, it does not follow that one must announce it to everyone. A prophet also need wisdom and understanding, to bring the message at the right time and in the right way. And he may abuse it that God has given him, so he or she shall pray for wisdom, which all others have to do. 10) The Prophet will be able to bring new things, but always in line with scripture. John. AD 16 12 As yet I have much to tell you, but I can not bear them now, 13 but when he, the Spirit of truth, comes, He will guide you into all truth: for he shall not speak of himself, but what he hears, He will speak, and the things to come he will tell you. 14 He shall glorify me: for he shall receive of mine and shall show it unto you. 15 All that the Father hath are mine: therefore said I that he shall take of mine and declare it unto you. God has shown me a few things in the past, including that it is only and only God the Father is the only true God. How will the prophets always bring new truths to the table, although they are not accepted at first hand. Then they will eventually be widely accepted and approved! 11) The prophet speaks for God, not his own. 1 Chronicles 21:9 And the Lord spoke to Gad, David's seer, saying: John the Baptist said he was the voice of one crying. Here's how it is and should be for anyone who communicates, teaches and directs in His Word, the voice of one crying! 12) Prophetic Voice can also be an analysis, assessment, and the like. Acts 21. 10 As we now were there for several days, a prophet named Agabus down from Judea, 11 he came to us and took Paul's belt and bound his own hands and feet and said, Thus saith the Holy Spirit: The man who owns this belt, tying him to the Jews in Jerusalem and thus give the heathen hands. 12 When we heard this, we prayed to him, both we and they of that place, that he had to go up to Jerusalem. 13 Paul answered: Why is crying and I tear my heart? I am ready not only to bind but also to die at Jerusalem for the Lord Jesus. 14 When therefore he did not let himself be persuaded, we settled down and said, spoon the Lord's will! Has a Spirit of God will understand a state of things in a different way. For example. what happened here in Norway at the government building and on Utøya 22 \ 7-2011 realized I was once related the Socialists opposed relation to Israel. In retrospect, it turned out that the night before they had an occult séance against Israel led by our Foreign Minister Gahr Støre. This is the reason for the terrible tragedy, no one does it with so will never understand why it happened. This is a prophetic analysis. Another example of what I would call a prophetic analysis and prediction in Acts 27 where Paul warned against going against his words and the consequences of it. He prayed, and God spared their lives. Then by becoming obedient against what he said. 13) There are different levels of prophetic speech. Acts 11:28 and one of them, named Agabus, stood up and announced by the Spirit that there should be a great famine over the whole world: he also came under Claudius. Here were the first Christians informed about what would happen to prepare for what is expected. We can and should expect that we as believers are informed in advance about important things. And the prophetic gift is a great blessing, enrichment and education at all levels. Amos 3 7 For the Lord GOD will do nothing except he revealeth his secret unto his servants the prophets. 14) The Bible is a prophetic book. 2 Pet. 1. 19 And the more firmly we have the prophetic word, which I do well to heed as a light shining in a dark place, until the day dawns and the morning star rises in your hearts. Resistance against the Bible, there will always be. Liberal theology, replacement theology, and other unbiblical theology is actually the serpent in more modern and civilized garb. The hose that came to Adam and Eve in the Garden of Eden and said and asked, "God has said," is stadigvek on the rise. Do not be fooled, and Christianity among different philosophies and teach God's because God's word speaks accurately and prophetically of all things. Remarriage among believers, female pastors, faith that God will torture people for eternity is the snake's poison among the believers. Expect that God's word will always be attacked, held for obsolete and second for it to match the carnal and sensual men. Satan is not afraid to hear the name of Jesus and other "spiritual name". But to follow, live by God's Word and proclaim it clearly hates him more than anything else! 15) Compare not the prophets of the old and new covenant. GT: 2 Kong. b 1 9 Now king sent a captain of fifty with his men off to Elijah. He came to the Prophet while he was sitting on top of a hill, and said, "O man of God, the king tells you to get down!" 10 Elijah replied, "If I am a man of God, the fire down from heaven and consume you and your fifty men! "And fire came down from heaven and consumed him and his fifty men. 11 Then the king sent another captain of fifty and his men, and he said to Elijah, "O man of God, thus says the king: Hurry up and come down," 12 But he answered, "If I am a man of God, the fire come down from heaven and consume you and your fifty men! "And the fire of God came down from heaven and consumed him and his men. NT: Luke 9 51 And it happened when it was getting towards the time that he was taken, when he turned his face toward Jerusalem to go up there, 52 and he sent messengers ahead of him. They went away and came to a Samaritan city to prepare for him, 53 and they did not receive him, because his face was turned towards Jerusalem. 54 When his disciples James and John saw this, they said, Lord! you want us to bid fire come down from heaven and consume them, even as Elias did? 55 But he turned and rebuked them, saying, I know not what spirit ye ​​are. 56 For the Son of man came not to destroy men's lives but to save. The old covenant is a criminal trial dominant, while grace and restoration is absent. It exists, but in the retracted form. But in the new covenant is the grace and restoration in the center, while the trial and punishment exists, but in the retracted shape and most of this age end. Referred to in Jesus' end-time speeches and Revelation. Eschatology means the study of recent times, where we find the verdict. But when the grace period by and thought the Antichrist! 16) Even if a prophet is not the fight, so it is not to say that not the message was from God. 1 Cor. 13. 9 For we know in part and we prophesy in part. We read in 1 Kings 13 about a prophet who had received a divine calling and mission, but he did not complete the call and service. The problem was that he had not done himself. Begun is not complete. But to believe that God was not through the prophet, it is to believe the lie. He joined in spirit but completed in the flesh. God worked mightily in and through them, until they are sure to follow God's word in one and all. This is a very informative account of a prophet of the Lord's command goes to the king, Jeroboam, to proclaim him Lord. Jeroboam had been King David's house because of haughtiness and then later fall at King David's grandson Rehoboam. Jeroboam had not taken lessons from case Rehoboam and his father Solomon's fall. God saves no one, even if one has a father who has been a man of God. God has no favorites, we are all servants and equal to him .. The Prophet beckoned to the King, and healed him, but the King would not repent. But the Prophet had made the main, been obedient to God's calling! At least in the first place. But the prophet from Bethel had received a message from the Lord, 9 For this commandment have I received of the Lord: You shall neither eat bread nor drink water, and you will not turn back the way you went. 10 Then he took off the other way and did not return the way he had come to Bethel. The Prophet preached so boldly to King Jeroboam this, it was the Lord's words. This began as right and good, would it continue? I think this here is a great lesson for us all, starting is not completed. This is a very informative account of a prophet of the Lord's command goes to the king, Jeroboam, to proclaim him Lord. Jeroboam had been King David's house because of haughtiness and then later fall at King David's grandson Rehoboam. Jeroboam had not taken lessons from case Rehoboam and his father Solomon's fall. God saves no one, even if one has a father who has been a man of God. God has no favorites, we are all servants and equal to him .. The Prophet beckoned to the King, and healed him, but the King would not repent. But the Prophet had made the main, been obedient to God's calling! At least in the first place. But the prophet from Bethel had received a message from the Lord, 9 For this commandment have I received of the Lord: You shall neither eat bread nor drink water, and you will not turn back the way you went. 10 Then he took off the other way and did not return the way he had come to Bethel. The Prophet preached so boldly to King Jeroboam this, it was the Lord's words. This began as right and good, would it continue? I think this here is a great lesson for us all, starting is not completed. 17) Prophet service ceased not the first Christians, but are active throughout the time the church household. Acts 2. 39 For the promise belongs to you and your children and all who are afar off, as many as the Lord our God shall call. John. AD 14 12. "Verily, verily, I say to you, whoever believes in me will do the same works that I do, yes, he will do even greater works than these, because I go unto the Father. " Jesus even said it on several occasions that even as the Father had sent him, we should also be issued. Promises is ours, so many Lord our God calls. Everything that the first Christians saw and experienced, we can now also experience, and experience. 18) Those who have founded the different denominations have probably had a lot of prophets service itself. Eph. 4. 11 And it is he who gave us some apostles, some prophets, some evangelists, some pastors and teachers. I'm pretty sure that those who founded the various movements, churches, etc. the pioneers had a lot of prophets service itself. If they did not call for either Apostles or prophets, they could probably have done it right. We see some today who say about themselves that they are both Apostles, prophets, and I do not know what, but with several failed marriages behind her, false prophecies, etc. They are sure both Apostles and prophets, but not real but fake! But it's sad but good to know that when a motion for a new truth, so they stopped up with it without going further. Therefore, it is about to do to never believe a man be trained on this earth, it is stadigvek new aspects of God's word to discover and to put himself in. We do not stop by with a new light on that there are three gods, but a God who is the true and only God who is already some; Father. It is even more countries to adopt said Barratt and Joshua on their death beds, where there is much wisdom and truth in. 19) When a prophetic religion is first organized, it usually shows a strong reluctance to accept the new prophets, which instead will be pursued as far as possible, silenced (in the major Norwegian encyclopaedia). In fact, those who are not looking beyond that there is spin-offs all the time. Matt. 23. 29 Woe unto you, scribes and Pharisees, hypocrites who build tombs of the prophets and adorn the tombs of the righteous, saying: 30 If we had lived in the days of our fathers, then we would not have been partakers with them in the prophets' blood! 31 Then ye give yourselves the testimony that I is their children who beat to death the prophets, 32 then also fill in your fathers' goal! It has been proven time after time. The people, movement, etc. God used before, hate and oppose that which God is raising up today. Rain never with the support of a denomination, movement or people. Count on God and the support of those whom God sends to you. And the rain never with a majority behind a prophet and his ministry. John the Baptist lost his head to preach the truth, I think that it also proclaims the truth of today must expect opposition and even persecution, even in Norway! 20) A prophet is a person with a divine calling, but he is also helping to shape it yourself. And the surrounding area also has a responsibility to show understanding, recognition and respect for the person or persons responsible for anything that goes against it than themselves. 1Sam. 16:7 But the LORD said unto Samuel, Look not on his appearance or his stature; For I have rejected him, I do not see what people are watching, for man looketh on the outward appearance but the Lord looketh on the heart. 2 Chronicles 8:20 p.m. The morning after they took an early and went to the desert of Tekoa: and as soon as they went out, Jehoshaphat stood and said: Hear me, O Judah and you inhabitants of Jerusalem! Believe in the Lord your God, and ye shall stand! Believe in his prophets, so shall you be happy with you! This is a recommendation to recognize and be muted in criticism, and others that, unfortunately, many do accept the Lord's true witnesses. It will backfire on you. The stronger and harder than criticizing and mocking the servants of God, the harder and more severe judgment of God will ultimately be to the person doing it. This is a spiritual law and can not change, but only accept and deal with it, just like gravity and other laws. Those we must organize ourselves for, they work anyway! But to criticize those who say they are apostles and prophets, but does not live the word of God teaches and preaches the word of God. There are both straight, healthy and necessary! But watch out so that a mix here than not, it can be to ruin both yourself and others. Final Comment: Matt. 21. 11 But the people said: This is the prophet Jesus from Nazareth in Galilee. Even Jesus, the prophet of all prophets. Was opposed, ridiculed and finally killed. Unfortunately, it turns again and again that people opt out of that is from God. Such prior to today. But we may be allowed to hope, believe and pray that God will meet people even today. The message and the opportunities are the same as they always have been. Everything is brought to pass for us in Christ, it's just for us to sit down and take us in faith. God is rich enough for all, only one will open up his heart, repent and believe the living God, whatever he has said in his holy and precious words! 2 Peter 3 16 and like in all his letters when he speaks to them about this: in them there is something that is very to understand, and which they unlearned and impressionable suggests interfered, and they do the other Scriptures, to their own destruction. It is so important to separate the wheat from the chaff, there is a difference between life and death, blessing and curse!